The Spigen Tough Armor in gunmetal is the new leader in lightweight protective cases. 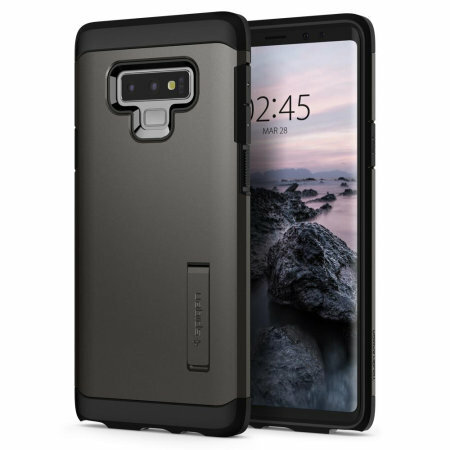 The new Air Cushion Technology corners reduce the thickness of the case while providing optimal protection for your Samsung Galaxy Note 9.
good looks and reasonable protection of the sides and back. Good access of the buttons. Just what my son needed perfect product fits his phone perfectly would by from mobile fun again !!!!!! Good quality case. As described. Happy with purchase. Looks very neat and almost like part of the phone for the black note 9 at least. Double layered and protects the phone well, the covers for the buttons allow easy presses and the pen is easily accessed. Make sure your screen protector is made to go with a case or this could lift the screen protector.